These corrugated tubes are made of stainless steel or copper and are named as stainless corrugated tube,metal bellows,stainless flexible tube or metal hose. Flexible tubes are used as flexible joints absorbing vibration of piping system and dislocation of the pipes. 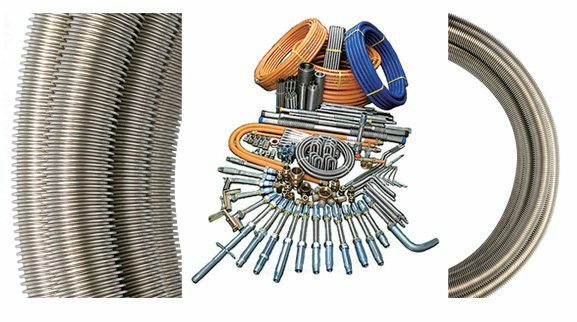 They are also used for gas pipes inside buildings and pipes for drinking water.Metal flexible tubes are classified into two types: annular type and helical type. A tube of annular type has an excellent flexibility and is easy to be connected with joint while it has a drawback of strong fluid resistance. A tube of helical type is not as flexible as annular type tubes and connection with the joints is quite complicated. But it has less fluid resistance compared with annular type tube and has an excellent spring characteristics. So, one of the two types can be selected and used depending on the usage.